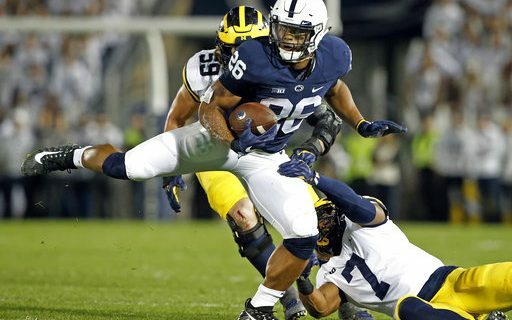 Bills fans, you need to be rooting for the Browns, Giants or Colts to have left the Combine convinced that that they should take Penn State running back Saquon Barkley with one of the top four picks in next month’s NFL Draft. In recent years, it would have been unheard of to take a running back that high. But Barkley may have changed that thinking with his dominant performance on the field at Lucas Oil Stadium. • Barkleymania. Penn State running back Saquon Barkley put some distance between himself and the field for the best player in the draft. “He’s the best running back prospect I’ve seen in 25 years,” Saints coach Sean Payton told me. Another team, which had given only four draft prospects perfect grades in the last 20 years, told me Barkley is the fifth. Why is this important to the Bills? Because if Barkley goes to one of those teams, that could open up a trade partner for the Bills. Or at the least push one of the top quarterbacks down a bit. Would Cleveland take Barkley #1 instead of a QB as expected? Can the Browns wait until #4 and still get him? If not, would they trade that pick? Would the Giants delay drafting Eli Manning’s replacement to take a win-now player like Barkley? Would the Colts, if they can’t get the ultimate complimentary piece to Andrew Luck, pursue a trade for #3? All of these scenarios have a direct impact on a team chasing Darnold, Rosen, Allen or Mayfield. Like the Bills. But first, some thoughts on whether Barkley could actually be the first running back taken first overall since Ki-Jana Carter in 1995. Buffalo Sports Page NFL Expert Greg Gabriel is not surprised that Barkely has entered the conversation as a top 3 pick. Leonard Fournette and Ezekiel Elliott were the other two top 3 running backs. Both had an immediate and significant impact on helping their teams make the playoffs. That’s the argument for taking Barkley that high. Plus, he’s a more versatile back than either Fournette and Elliott. Barkley’s ability to catch passes, split wide as a receiver and return kicks makes him much more like the modern running back. He’s not a hammer like those other guys, but may be just as effective in a Le’veon Bell-like role. While Fournette made an impact for the Jaguars, who were the most-talked about running backs in 2017? It was Alvin Kamara and Kareem Hunt. Both were drafted in the third round. So can you get equal effectiveness from a back taken much later than the top 3? That’s what those teams will have to decide. Barkley is a special talent. But even at Penn State, he was never a 20-25 carry a game back. He had only 3 100 yard performances during his junior season. That may not be enough for a team to invest such a high pick in a player at a position that has become interchangeable in the NFL. Running backs, even good ones, are too injury-prone and their careers too short. Barkley may benefit from a lack of players, other than a quarterback, who could be top five draft picks. Bradley Chubb of NC State is a possibility as the best pass rusher in the draft. Maybe a game-changing defensive back like Minkah FItzpatrick of Alabama could go that high. But there is no surefire receiver, defensive tackle, linebacker or offensive tackle who would take one of those top five spots. Quenton Nelson is considered one of the best overall players, but as a guard, some teams won’t see the value in taking him that high. So whether he’s worth it or not, Barkley may go in the top five. That’s good for the Bills for the reasons stated above. Keep an eye out for a team that may miss out on Barkley like the Giants or Colts. They’ll be waiting for the phone to ring to see what QB-needy team wants in. There’s a chance one of those calls could come from the 716. For more combine coverage, read Bob Gaughan’s winners and losers on offense & defense.